Some people look at science and think that it wrecks the mystical nature of being. That there’s a little less magic in the world when another scientific law is discovered. People like Bill Nye and Neil de Grasse Tyson remind me that there is magic in science. There is a fascination with the way that things work that you can’t find by just being okay with a thing working without explanation. 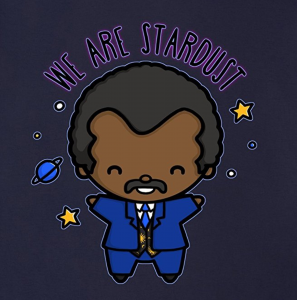 Wrap this cloth around your torso to remind yourself that we are all stardust. We have a magic in us, and that magic yearns to understand itself. That’s what science is.